07.12.2007, Conté pastel pencils on 32" x 40" black paper. A great silver dragon births a phoenix from his fiery breath, as they fly around a sun mandala. 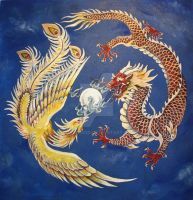 In Chinese literature, the Dragon represents the male, or Yang, while the phoenix represents the female, or Yin. They complement one another, creating balance. When together, they are the symbol of marital happiness and harmony. Could use this as droning earth vol75 cover art, mostly psychedelic/stoner music, all i can give is credits, its a free download. I love the detail you put into this piece! It looks amazing! Beautiful color and imagery. The Yin/Yang, one dark, one light. Wonderful art work. Well done! Beautiful would love to use this as the pattern for my headboard. May I use this as a tattoo? Sure, absolutely! Please send me a photo of it when it is finished! i really love this illustration!! looking it up because of a story i've been following, in my dreams and symbolic life recently. quick summary: i see spirits and stuff, and i'm clairvoyant. when i close my eyes then i see the dragon, but the phoenix is hidden behind a dark circle like an eclipse covering it. i wonder why this is. but then someone told me it's the midnight of the soul, or something like that. (and that i do the midnight shift a lot for whatever reason but i don't know about all that, i just hear voices every now and then). glad i found your work, i found this on google and saw the signature and just guessed you'd be on deviantart. glad to find you here! Thank you for your comments! I am glad you like this artwork, it is one of my favorite pieces. That is a very interesting interpretation of the Phoenix and Dragon. The Phoenix does represent the feminine, the yin, and darkness, so maybe your vision has something to do with that as well. Oh I loved that movie! Thank you. I am already aware of this, I am just taking artistic liberties. I love this indeed!!!! VERY WELL DONE!!!! Much love to you my friend! My title for this is "perfection", I hate to put any other words to this other than "love" it is beautiful indeed how intertwined the two are to harmony!